Lawrence “Larry” P. Wakefield, formerly of Fairfield Bay, AR, died in Port Washington, Wisconsin on April 6, 2013 at age 91. Larry was born in Syracuse, NY on July 10, 1921 to Adelbert L and Ruth Lewis Wakefield. He proudly served in the United States Army during World War Two in the European Theater, where he received the Bronze Star. He achieved the rank of Major in the Army Reserves before his honorable discharge. He married Barbara J. Neu of Fort Custer, MI on October 2, 1943. 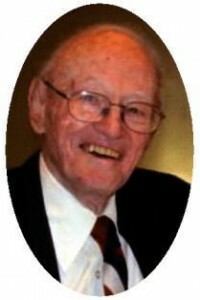 He graduated from Syracuse University in 1943 with a Bachelor’s Degree in Business Administration. He worked his entire career in the insurance industry. He managed branches and regions for Atlantic Insurance of New Haven, CT and San Francisco, CA as well as CNA Insurance Branch Manager for Milwaukee, WI. He was named the National Director of Workers’ Compensation for CNA Insurance in Chicago, IL. Larry was a tremendous mentor, teacher and sports enthusiast enjoying swimming, hiking, canoeing, sailing and skiing. He has been very active in his church and a beloved friend of many. Upon retiring to Fairfield Bay, AR, he served in leadership roles in the community through the Audubon Society, AARP, Nursing Home Advocacy, VFW, American Legion, Lions Club, Food Pantry and Meals on Wheels amongst others. He loved travelling and enjoyed tour the United States, Mexico and Europe. He also loved to sing and honored his family and friends. He is survived by his daughters Joan Madeline Wakefield of Honolulu, HI and Patricia Ann (partner Kate Pelzer) of Port Wasington and his loving partner of 8 years Adele Hartig of Fairfield Bay, AR. He is further survived by sister-in-law Doris (the late John “Jack”) Neu of Clearwater, FL; niece Maryanne Neu Goodell; nephew Jack Neu; other relatives and friends. His is preceded in death by his wife of 58 years, Barbara on May 26, 2001. Pastor Jeff Suddendorf will officiated funeral services 1 pm Saturday, April 13, 2013 at the Poole Funeral Home, 203 N Wisconsin Street, Port Washington, WI. Visitation 11 am to 1 pm Saturday at the funeral home. Interment Arlington Park Cemetery, Milwaukee, WI. Memorials to the Ozaukee County Humane Society, (630 W Dekora Street, Saukville, WI 53080) or Heritage Nursing Center Resident Social Fund 1119 N Wisconsin Street, Port Washington, WI 53074) appreciated.